Two weeks ago, my daughter was playing with her “Skip-it” – a simple looking toy that has a ball connected by a rope to a small hoop. The hoop goes around your foot. The objective is to swing the ball around in a circular motion and jump over it with your free foot… kinda like jumping over a helicopter blade. The toy is pink and cute and innocent looking. A few seconds into her playing with the Skip-it, I hear screams. My wife runs outside. Soon, she is carrying our daughter, who has bloody hands and knees, inside. What happened? She landed on the ball (instead of jumping over it) and fell face-down on the driveway. A couple of days ago, my daughter has the Skip-it out again. She does a few rounds successfully… and a neighbor girl walks up. The neighbor asks if she can try. Now I’m mad. Not at my daughter or the other girl. I’m mad at that stupid toy. I tell my daughter that I think we should throw the evil Skip-it away. She cries. I explain: I don’t want her to get injured anymore / I don’t want neighbor kids to get injured anymore / when I was a kid, we had a neighborhood slip-n-slide… until a neighbor kid was rushed off in an ambulance because of a neck injury that paralyzed him (temporarily) – we never had a slip-n-slide in our neighborhood again. …then I told my daughter, “I think I need to take you shopping for a new toy this week.” She lit up like a Christmas tree. Rejoicing. Jumping. Cheers. Grins…. I took her shopping last night and got her a new toy (one that isn’t evil and won’t cause bodily harm). I don’t think she’s missing the Skip-it anymore. Similarly… God loves his kids. He is not mad at us. He doesn’t like the “evil toys” that cause us harm. Letting go of the bad stuff can be difficult. Go ahead, do it anyway. See what God does in your life. God doesn’t empty your life of good things; He fills your life with good things! Grace is God giving me something I cannot obtain on my own. 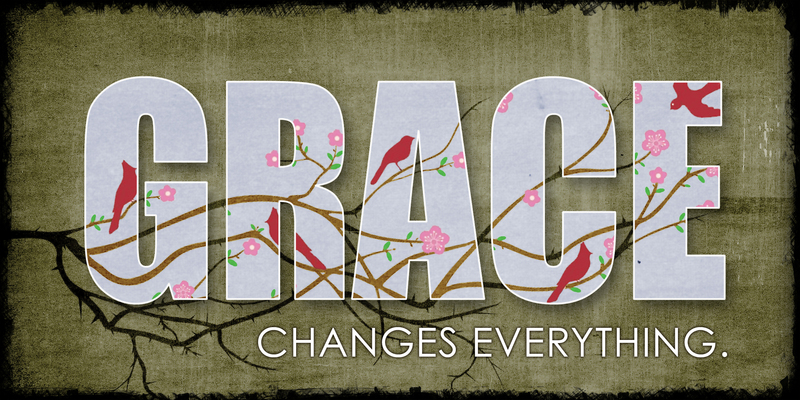 Grace is being accepted by God even though I do not deserve it and am not worthy of it. God gives me grace because He loves me. Grace removes the sin-stain and makes me right (pure and holy) before God. “Since we’ve compiled this long and sorry record as sinners and proved that we are utterly incapable of living the glorious lives God wills for us, God did it for us. Out of sheer generosity he put us in right standing with himself. A pure gift. We had 2 service dogs in church on Sunday. That’s pretty cool. Our church is growing (with dogs). So far I’ve only met Fritz, but I’m looking forward to meeting the other dog as well. Both dogs paid attention, looked happy and were generally more well-behaved than some of the humans. I wonder if they get counted in our attendance numbers? We also had 2 Seagals in church on Sunday (go Seahawks!). The new song by Carlos Whittaker, Grace Already Won, was amaz-A-zing! I was still humming it at 10pm. I am all fired up about our new series: Grace Changes Everything. In my opinion, this is the most important teaching I’ve ever shared. The Gospel is the Good News of God’s Grace. If we don’t get this, everything else is gonna be a waste of our time! Grace was everywhere on Sunday… like in big letters on the stage. I love all the reminders around our building that Grace Changes Everything. Baby/child dedications are so fun. Dedicating little August Ohashi in the 10am service was the highlight of my day. During the dedication, I was talking about parents bringing their children to Jesus and the disciples attempted to stop them. Jesus scolded the disciples and invited the children to come – and he blessed them. As I was telling this story, it occurred to me: Jesus wants to bless people we don’t think he wants to bless. Sunday night, our two Fairwood softball teams played each other – it was Fairwood vs Fairwood. Congratulations Fairwood, you won! It was a great weekend. I love what God is doing in our church.